I had to begin this post with a picture of the food. Tandoor Bakery and Restaurant in Portland, Maine, kindly and deliciously provided an amazing meal for all of us who "broke the fast" for Ramadan together this past Friday night. 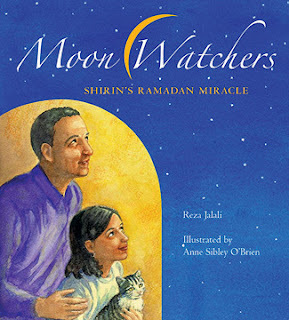 The line was out the door at the Rines Auditorium, the conversation was great and even though I thought I knew about Ramadan I discovered I had more to learn. 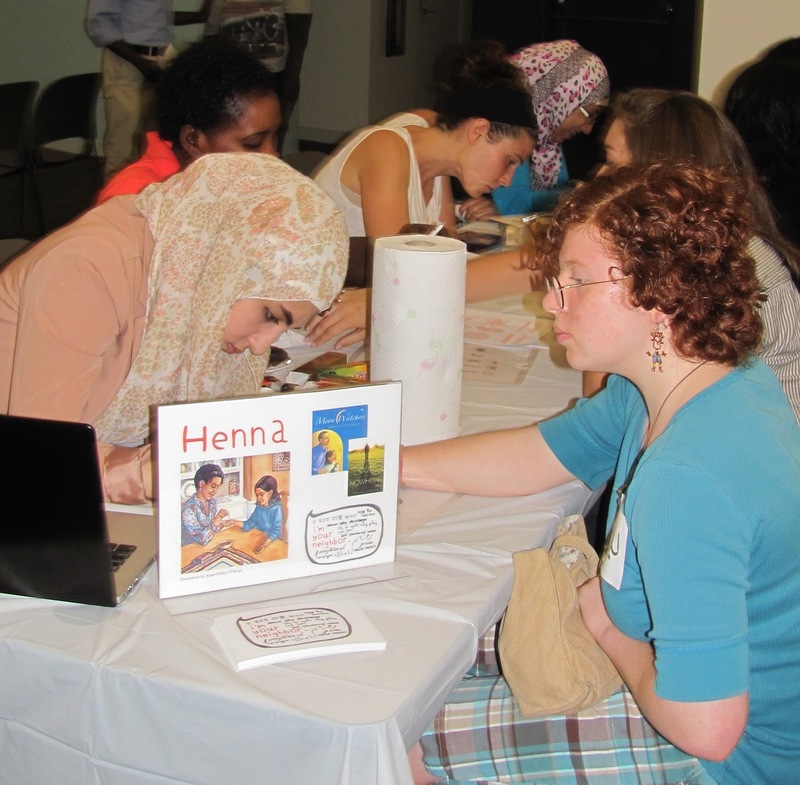 This was all part of the I'm Your Neighbor multicultural community read which is going on in Portland throughout the year, and Friday's event focused on Ramadan and featured my book, Out of Nowhere, and Moon Watchers, by Reza Jalali, illustrated by Anne Sibley O'Brien. The evening began with Reza sharing memories of Ramadan from his childhood, explaining what the month-long fast is all about, and telling us how his family practices today. Even though this is a "childrens" book, readers of all ages would love the story and gorgeous illustrations. Throughout the evening there were prayer rugs on display, books from the I'm Your Neighbor collection for sale and to check out from the library, and henna hand painting demonstrations. Following Reza's presentation, Pious Ali, of Maine Interfaith Youth Alliance, led a panel discussion which included me, my friend (and great resource for Out of Nowhere) Shobow Saban, Reza and Anne. After that, it was time to FEAST. We broke the fast with a prayer, and those who hadn't eaten all day were first in line. Great food and fun conversation followed. Anne Sibley O'Brien serves up dessert! Pious Ali (center) shares dinner with friends. Shobow was eager to get to his meal (you can't see it but he's holding a plate) but conversation came first. I was thrilled to be part of this amazing evening. Next up on the I'm Your Neighbor schedule: A Path of Stars, a celebration of Cambodians in Maine, Thursday, August 8th.